Are you a beginner GNU/Linux user and wish to look beyond the usual window dragging and mouse clicking? This guide is intended for the absolute beginner users wishing to learn the basics of GNU/Linux command line. This tutorial intends to walk through basic Linux commands related to navigation, file and directory administration, software installation and basic system troubleshooting. The chances are that whenever you hear somebody talking about the GNU/Linux operating system you also listen to them talking about command line or Linux commands. Run this command and execute this and that command! Right? However, why? Why is it that the GNU/Linux operating system is almost always linked with commands and command line? The simple answer is that command line is an integral part of the GNU/Linux operating system, and as such it offers the user a possibility to perform tasks more efficiently, with better precision and most importantly with additional insight information about the entire execution process. Many GNU/Linux's beginner users associate the command line, and Linux commands with trepidation, high-level wizard magic skills and unnecessary overhead. Let's be honest with ourselves! No matter what excuse you might have for your aversion to GNU/Linux system and its command line, the cause is most likely linked to the lack of understanding and reluctance to learn. Therefore, let's not blame the GNU/Linux system for our shortcomings! It is here to help whether you are a complete beginner or advanced level user. To what extent the system can help you does not depend on the depth of your wallet as this is the case with some other proprietary operating systems! The amount of help you receive from the GNU/Linux system is solely dependent on your willingness to learn and your determination. At this stage, I'm sure that the question you are asking yourself is: Do I need to learn the GNU/Linux command line and the myriads of commands to use GNU/Linux operating system? The quick answer is no! Any decent GNU/Linux operating system with GUI installed does not require the user to use the command line to perform basic and even advanced tasks. The only reason why you might consider to learn the GNU/Linux command line is to improve your efficiency to get the most of the system and if the task ahead requires you to do so. Remember many GNU/Linux users go for years without even knowing what command line is! Not knowing the Linux command line is perfectly fine, and if the system does what you need there is no need to learn even the most basic commands. No matter what flavour of GNU/Linux operating system you are using, whether it has Graphical User Interface or not, the command line is always present in some form. Hence, if you know the command line basics, you still feel at home regardless of the system in use. Command line, by use of the variety of commands, allows you to administer the system and perform even the most complex tasks on any the GNU/Linux system without GUI as well as remotely across the long distances seemingly making you feel you are sitting right in front of the computer. However, to do so, one needs to possess at least the rudimentary understanding of the GNU/Linux command line and learn some basic usage of some of the commands it offers. Do not be afraid, as this is precisely what you are going to learn by reading this Linux commands tutorial. Linux commands are the essence of the entire GNU/Linux operating system used to administer the entire system. You may not know it, but most of the applications you run within the graphical user interface are executing Linux commands for you in the background to accomplish the given task. Letting the application to run Linux commands automatically for us has many obvious benefits. However, the disadvantage is that in many cases we are unable to customise the command execution to craft it towards the desired result. Furthermore, if something goes wrong, the user is most likely left in the dark without any hint on how to even begin to troubleshoot the issue. 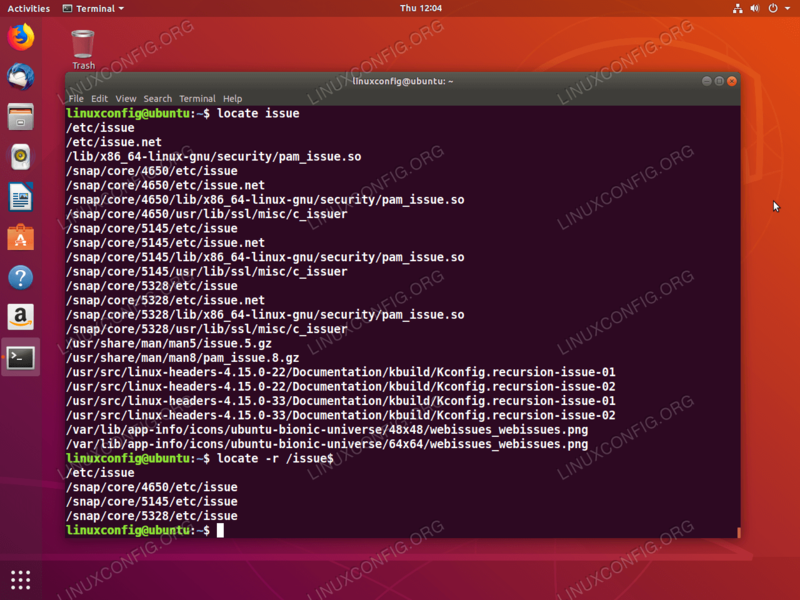 There are exactly 2024 commands available on a my Ubuntu Desktop Linux installation. The number of commands available on your system will be different. The bottom line is that on average the GNU/Linux operating system may contain few thousands of commands which ultimately also answers our next question which is whether the user needs to learn all of them. Well, you may try, but this quest is destined for failure. For this reason, the best approach is to start with the basics; the absolute must learn Linux commands to help you navigate the GNU/Linux filesystem and to perform the basic administration tasks. Once you accomplish this task and grow confident with the Linux command line, the rest comes naturally with the minimum effort simply by just using the GNU/Linux system. All you need is an open mind and determination. Ok, enough with this idle talk and let's get to it! Understanding the difference between Linux command line arguments, options and parameters is likely the most crucial part if one wishes ever to understand the GNU/Linux command line fully. Hence, do not skip this topic but instead make sure you understand it thoroughly before moving forward to the next section. The above command consists of two arguments. The first argument referred to as argument 0 is the ls command itself and the second argument numbered as 1 is the ls command's option -a. The command options allow the user to modify the command output. Every Linux command has a different set of options. The command options are hard-coded into the command itself. As the name suggests, the command options are optional and do not require the user to use them. In this case the lscommand's option -a instructs the command to print also hidden files or directories located within our directory. If you follow, you already know that the above command consists of three arguments. First, there is the 0 argument of the command itself. The second argument, more precisely, the argument 1 is the ls command's option -l which instructs the ls command to produce long listing output giving the user more information about one or more files. Lastly, the third argument number 2 is a parameter supplied to the ls command telling the command to act only on a single file named .bashrc. Please note that in the case of the above .bashrc file the prefixed . is part of the filename and it indicates that the file is hidden. Hidden means that the ls command will not list this file as part of its output by default, unless the -a option is used. In this case, our command consists of five arguments. There is the ls command, two options, namely they are -l and -h and lastly there are two file names as parameters, the .bashrc and .bash_history file. The following video summarises the entire section. By now you should have a clear understanding of what are command line arguments, options and parameters. This section covers yet another essential part of Linux command line which is the filesystem navigation. Over the years I have seen many users having a hard time to understand the GNU/Linux filesystem navigation as it dramatically differs from the usual C: or D: drives. In this section, you will also learn a first two Linux commands, which are the cd command and the pwd command. Let us start with the following statement: Forget about C: or D: drives you know from other proprietary operating systems. This knowledge does not apply here and can only confuse you. The GNU/Linux filesystem allows access to any hard drive or partition from any directory within the entire filesystem. However, at this stage, we should not be concerned about that. Perhaps the best analogy to describe the GNU/Linux filesystem is the one I have already used for my Bash Scripting Tutorial. Imagine the GNU/Linux filesystem as a multiple storey building. The so called root directory (building's entrance door) indicated by / provides the entry to the entire filesystem (building), hence giving access to all directories (levels/rooms) and files (people). To navigate to room 1 on level 3 we first need to enter the main door /, then make our way to level 3 level3/ and from there enter the room1. Hence, the absolute path to this particular room within a building is /level3/room1. From here, if we wish to visit room2 also on level3 we first need to leave our current location that is room1 by entering ../ and then include room's name room2. We took a relative path to room2 which in this case is ../room2. We were already on level 3, so there was no need to leave the entire building and take absolute path via the main entrance /level3/room2. Confusing? Do not worry after few sessions with the GNU/Linux command line the knowledge sinks in and becomes a second nature to you. The pwd command example to print the current working directory path. By default, your starting working directory is always your home directory. Every non-system user has its directory located within the /home directory. As illustrated on the above image the absolute path to the home directory of the user linuxconfig is /home/linuxconfig. If your system includes user "john", then the absolute path to this user's home directory is /home/john. The access to any user home directory is only available to the actual user who owns the directory and to the administrator who in the case of GNU/Linux is the root user. At this stage, we should know how to enter commands on the command line, and we also know how to obtain our current location within the filesystem. It is time to start moving around. To do just that, we use the cd (change directory) command. The cd command allows the user to navigate to any directory available on the filesystem under the condition that the user has proper access permissions. Except for Line 5 and Line 6 the above commands should be self-explanatory. On Line 5 we have used shortcut ../ to move up to a parent directory of the linuxconfig directory. On Line 6 we have moved two directories up and eventually navigated to the etc directory. Execute the cd command without any arguments to instantly navigate to your user home directory from any location. Execute cd - to toggle between your last two visited locations. In what directory do you end up after executing cd ~ and cd . commands? Linux command line navigation using the cd command. Can you tell the difference between the absolute and relative path? Looking at the above image can you count how many times we have used absolute vs relative path when navigating the filesystem using the cd command? HINT: The absolute path always starts with the / character. Traversing the GNU/Linux filesystem and understanding the difference between the absolute and relative path is not an easy topic for any beginner. Before moving forward make sure that you feel comfortable with the cd Linux command and the navigation between directories, as this knowledge is going to serve you well in the upcoming sections. 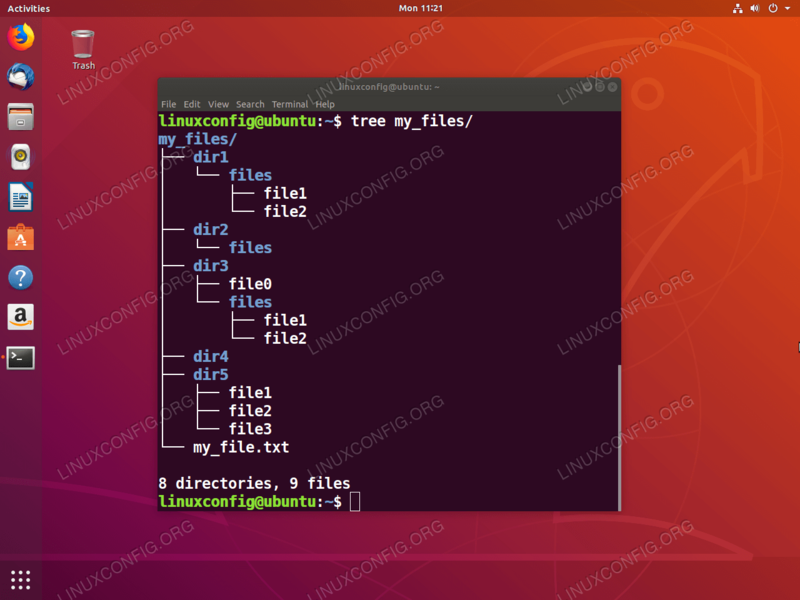 At this point, you should be comfortable with filesystem navigation using the cd command, and you also possess a basic understanding of the GNU/Linux command line in general including the command line arguments, options and parameters. So far we have learned how to navigate to any directory but have not learned how to list directory content yet. Listing a directory content is the main topic for this section. Color highlighted vs regular ls command output. By executing the ls command without any options or parameters, the command lists the content of the current working directory. Many modern terminals provide the user with additional information by colouring directories as blue, regular files as white and executable files with green colour. Be aware that you won't find this kind of luxury on many terminals, and for this reason, we need to learn how to distinguish between the various types of directory content items manually using the ls command. Most commands come with a manual page which can be used to learn about its function as well as what arguments each specific command accepts. Use the man command to display manual page of any desired command. For example to display a manual page for the ls command execute man ls. To quit from manual page press the q key. ls command long listing option -l provides an additional information about each directory item. Highlighted is the file type information for each directory item where d denotes a directory type and - indicates a regular file. By using the -l option, the ls command provides the user with extra information such as the permissions, user or group ownership, file size and modification time. Another common ls command option is -a which lists all as wells as the hidden files or directories within the directory. Any file or directory that has its name prefixed with . is hidden thus not included as part of the default ls command output. Display the file size using the ls Linux command. By default, the ls command displays the files size in bytes, that is unless the -h ( human readable ) option is supplied. Note that the -h option has no meaning unless provided in combination with the -l option. Example of an absolute or relative path parameter with the ls command. Use the ls command's manual page and see if you can find a way to show the content of the /etc directory in descending order based on the file size. The purpose of directories is to keep the filesystem, hence our and system files organised. In this section, you learn how to create directories using the mkdir command on the GNU/Linux command line. Creating a directory on the GNU/Linux system is as simple as executing the mkdir command while stating the desired directly name as an argument. Try it now. Open the terminal and create a new directory named, e.g. dir1 in your home directory. Avoid creating files and directories with space as part of their name. In Linux it is possible to create a directory or file name with space in it by surrounding the name with quotes, e.g. mkdir "my files", but this may create problems later on so avoid it at all costs! If you need to use space in the file or directory name, then use an underscore _ instead. Next, use the ls command to list the content of your current working directory, and if the directory was created correctly, you should see it in the command output. Same as creating the directory inside your current working directory you can also create a directory anywhere on the filesystem, given that you hold proper permissions to do so. Let's now create a new directory called example within the /tmp directory. There are now two ways how to approach this task. First, we could navigate to /tmp using the cd command and once in the directory execute the mkdir command followed by the new directory name. There is not much to learn regarding the mkdir command. As long as you understand the difference between absolute and relative path as explained earlier, you are fine. There is only one other common option used in combination with the mkdir command, and that is the -p option. Creating directories using mkdir command on the GNU/Linux command line. Using your user account, attempt to create a directory called my_dir within the /etc directory. Does it work? If not, why? The GNU/Linux system stores majority of information about settings, configuration as well as data such as logs in the form of plain ASCII text files. For this reason, it is essential for any user to have at least a basic understanding of text file manipulation. In this section, you learn how to create files, read the file content and how to edit a text file using a simple command line based text file editor. That is all! You have now successfully created a new file called file1 within your home directory. Execute the ls command now, and you should see this new file to sit in your home directory. 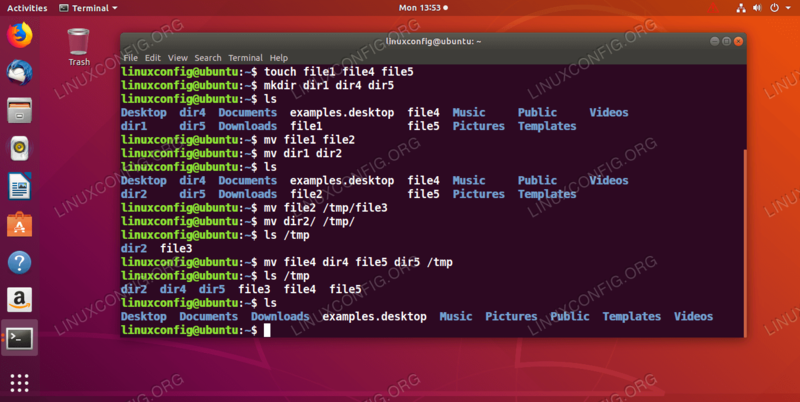 Create file by using the GNU/Linux command touch. Perhaps, you may have noticed that we have created a file without an extension such as .txt or .exe. Note, the file extension on GNU/Linux systems mostly does not have any meaning apart from the fact, that upon the execution of the ls command to list all files and directories it is immediately evident that a file with an extension .txt is plausibly an ASCII text file and a file with .png is likely to be an image file. At this point, it is important to point out that there are many ways on how to create a file on a GNU/Linux operating system. In reality, it is scarce that you need to create an empty file as we have done previously. In fact, the primary purpose of the touch command is not to create files but rather manipulate with file timestamps, which is a tale for another time. Once you execute the nano command, the nano editor opens and lets you edit the content of the new todo-list.txt file. While in the nano editor perform any modifications to the file content as required. Open the nano editor. Enter the desired file name as parameter. Edit the file content by entering the desired text. Once ready press the CTRL+o key combination to save the current file content. Confirm the filename and press the ENTER key. Continue editing and repeat the previous two steps or exit the nano editor by pressing the CTRL+x key combination. The new file named todo-list.txt is now created and should be visible upon the ls command execution. You can continue editing any existing text file by specifying the file name as a parameter to the nano text editor command. So far we learned how to create a file and how to edit existing or new text file using a command line text editor. What we have not covered yet is how to read the content of the text file. Well, honestly, there is not much to it! You can read the content of any file by using the cat GNU/Linux command. Use the cat command to display a content of any text file. Simply supply the file name as a cat command parameter. Some files may span across thousands of lines. Try looking up the content of the /etc/services file by using the cat command. Some terminals have a limited number of lines and no scroll bar. Hence it would not be possible to read the content of large text files by simply using the cat command. Experiment with commands such as less or more to read the content of the /etc/services file. Before we mark this section as "Done and Dusted", there is one more command you should familiarize yourself with. This command is called file. Obtain the file type information by using the file GNU/Linux command. Another logical step is to learn how to rename or move files and directories. At this point, we have discussed how to create files or directories, but what about moving existing directory or file to another location? Well, you should be pleased to know that moving and renaming files or directories under the GNU/Linux system is in core essentially the same. Renaming and moving files on the GNU/Linux filesystem is a straightforward task. All that is required is the mv command and the understanding of the absolute and relative path as previously covered in the above File system navigation section. Using the above touch and mkdir commands we have created a file named file1 and directory dir1. The usage of the touch and mkdir commands have been already covered previously, hence the explanation should not be necessary. The first command has moved file2 into directory /tmp/ and renamed it to file3. The second command has moved dir2 into /tmp/ and since we have supplied the same destination directory name the directory name remains the same. The only rule to follow with multiple mv command parameters is that if there are multiple source parameters supplied to the mv command the last supplied parameter must be a directory. The above mv command have moved multiple files and directories into the new location: the /tmp directory. It is important to point out here that no matter how many source files or directories you are going to supply to the mv command as parameters the last supplied parameter is treated as a destination. Before we move to another topic it is important to mention one, possibly damaging fact about the mv command. 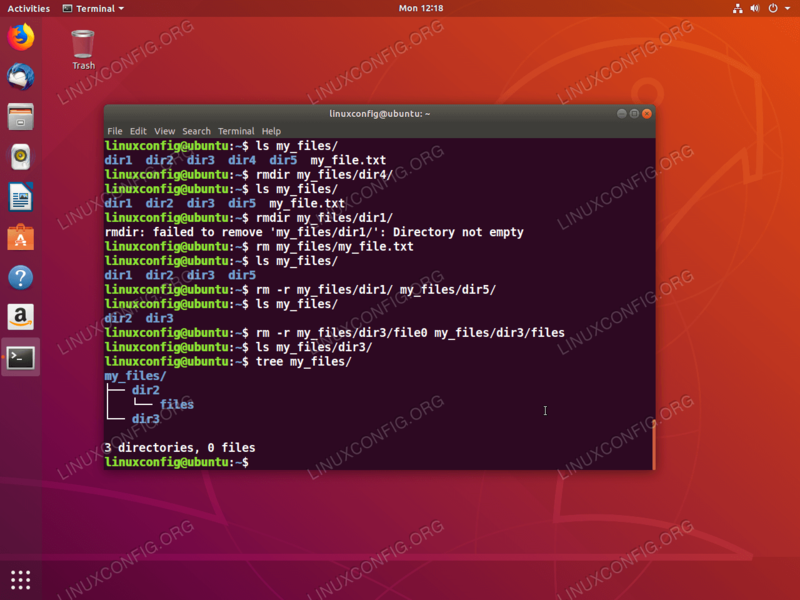 Working example on how to move and rename files or directories under GNU/Linux by using the mv command. In the previous section, we discussed how to move files and directories from one location to the other by the use of the mv GNU/Linux command. This section covers a similar topic on how to make a copy of files and directories by using the cp command. Most of the knowledge gathered from the previous section is going to help us to learn the cp GNU/Linux command as the syntax for both mv and cp commands is very similar. The main difference is that instead of moving the files or directory the cp command creates an exact copy of the source file or directory. As it is with the mv command the cp command requires to be supplied with at least two parameters. The first parameter is the source file or directory and the second parameter is the destination file or directory. By executing the single cp command make a copy of the /etc/services file to your home directory and rename it to port-numbers.txt. As it is the case also with the GNU/Linux mv command, the cp command also accepts multiple parameters. Meaning, that it is possible to copy multiple files and directories at the same time by execution of the single cp command. 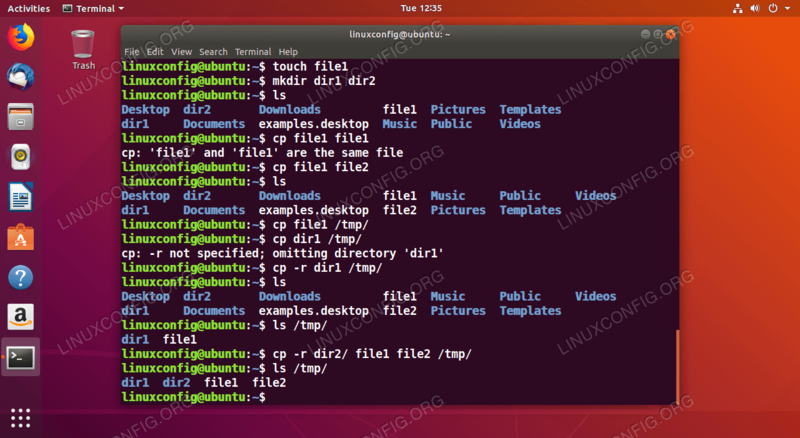 cp GNU/Linux command examples to copy directories and file on the GNU/Linux file-system using the GNU/Linux command line terminal. At this stage, you should be quite confident with the Linux command line basics. You may also have noticed a pattern in which commands are used. You should know how to create, move and rename any file or directory. However, without knowing how to remove files or directories, your filesystem fills up, hence the ability to store more data will be lost. Two commands will be covered in this section. The first command is rmdir and the second command is rm. When looking at the names of both the rmdir and rm commands you may quickly conclude that the command rmdir is used to remove directories and the latter command rm is used to delete files and for the most part you are right. Let's start by looking at the rmdir command first. Practice directory structure to learn how to remove files and directories using the rmdir and rm commands. As you can see, the above rmdir command failed to remove the dir1 directory. The primary job of the rmdir is to remove directories, and since the directory dir1 contains files, the rmdir command omitted this directory with an error message complaining that this directory is not empty. The logic is sound! The only way to remove non-empty directory is to use rmdir's rather long command line option --ignore-fail-on-non-empty. However, at this point it is much easier to use the rm command. The rm command is with a correct combination of options capable to remove any number of files and directories whether the directory is empty or populated with any number of files and sub-directories. Removing files by using the rm command is irreversible action. Meaning, that depending on your file system in use and your system usage your data cannot be recovered. Make sure to measure twice and cut once when using the rm Linux command. Using the rm command is quite straight forward. As many other Linux commands it accepts multiple parameters thus can easily remove single or any number of files and directories. Removing files and directories using GNU/Linux command rm and rmdir. Execute the single rm command to remove the entire my_file directory located within your home directory. At this point, you should be quite comfortable with file-system navigation and file/directory management. Before we move to the next section dedicated to basic GNU/Linux system administration commands, we should discuss how to look for files in case such a need arises. There are two main Linux commands which allow a user to search for files. Namely, it is the locate command and the find command. The find command is a powerful tool hence it can be a little bit overwhelming to use, especially when it comes to beginners. For this reason, we cover the locate command only as it is much easier to use. The above command produces a list of files or directories within the entire file-system containing the string issue anywhere within the file or directory name. Depending on what you are searching for this list can grow to a substantial size. Therefore, searching for an exact filename match is likely to produce an output we are more inclined to find accommodating. To do so, we need to use regular expressions and the locate's command line option -r.
Before you promote yourself into a rank of the locate Linux command master, let's briefly discuss how the locate command operates. The locate command is extremely fast in search, because it merely consults existing pre-build database index file updated once a day with use of the updatedb command. 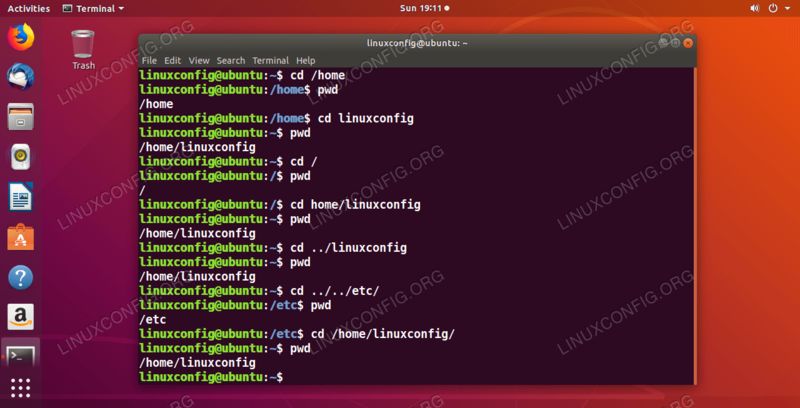 Try to play with the locate Linux command and see if you can find a way how to instruct the command to search for files only within a particular directory. Most of the Linux commands you will run will be executed without administrative privileges. As a matter of fact, executing commands with administrative privileges is recommended only in the case that the task ahead requires it. Following this simple rule will contribute to overall system integrity and will allow the user to avoid costly and unnecessary mistakes while interacting with the Linux command line. The whoami command always returns a username of the user who executes it. In this case we can see that prefixing the whoami Linux command with the sudo command ensures the whoami command to be executed as the root user. By default 5 minutes are given to a sudo user to enter privileged commands repeatedly using the sudo command without password after the first successful authentication. Anytime you read any Linux related documentation which is asking you to run Linux commands from the terminal, you'll see all commands prefixed with either $ or #. The $ sign requires any given Linux commands to be executed as a regular non-privileged user. On the other hand, # indicates that the given Linux commands to be executed with root/administrative privileges either directly as a root user or by use of the sudo command. The default installation of your GNU/Linux system can be and very often is customized to include additional software to suit your needs. If there is a difference between various GNU/Linux distributions, it is the way on how the software is installed. The software is delivered in the form of packages available from relevant distribution package repository. There are two main branches of GNU/Linux distributions when it comes to software package management. Namely, they are DEB and RPM. The first branch is using apt and the second branch is using the yum command to install software. Of course, there are many other auxiliary commands to help with software installation or maintenance, but the basics are explained below. The above commands will produce a list of package names and their relevant description. Read the description column and select a package from the left column which you would like to install. Once you have selected the package you wish to install execute again a relevant package management command to install the package. Using the apt command line software package management tool to install software on the Ubuntu Linux system. To quit and return to the command line press the q key. In this section, you will learn how to check a directory and file size as well as how to obtain information about your current disk space usage. The first Linux command we are going to cover in this section is the df command. The command name df is an abbreviation of the words disk free. Check for free disk space using the df command within the /home directory. NOTE: Checking the directory free space with the df command does not reveal any information about its size. The df command only outputs the information about a partition disk space usage in which the directory is located. To check directory size use the du Linux command as explained below. Now that we have learned how to check for free disk space it is also important to know how to retrieve information about a file and directory size. Example of using the du Linux command to check the size of the /home directory. Run the man ls command to get a quick overview of all possible ls command options. Can you find a way how to use the ls command to list all files a directories sorted by their disk size in descending order? In this section, we will discuss few ways of how to compress and decompress files on the GNU/Linux system. The first tools you will learn are the tar and gzip commands. The tar command is mostly used to combine the entire directory into a single file and optionally applying compression in the process if necessary. The files produced by the combination of the tar and gzip commands are called gzip tarballs or simply tarballs. Example of the file and directory compression and decompression using the tar, gzip and gunzip Linux commands. When it comes to shutting down and rebooting the GNU/Linux operating system there is only one command you need to learn, which does both, reboot and shutdown. This command is intuitively called shutdown. Yes, it is true you can reboot your system with for example the init 6 or reboot command, but learning the shutdown command gives you more power and options. Below there are a few examples of the shutdown command. This section will introduce you to some basic networking skills. In particular, you will learn how to obtain an IP address of services required to establish a proper Internet connection and how to troubleshoot network connectivity and an Internet connection. 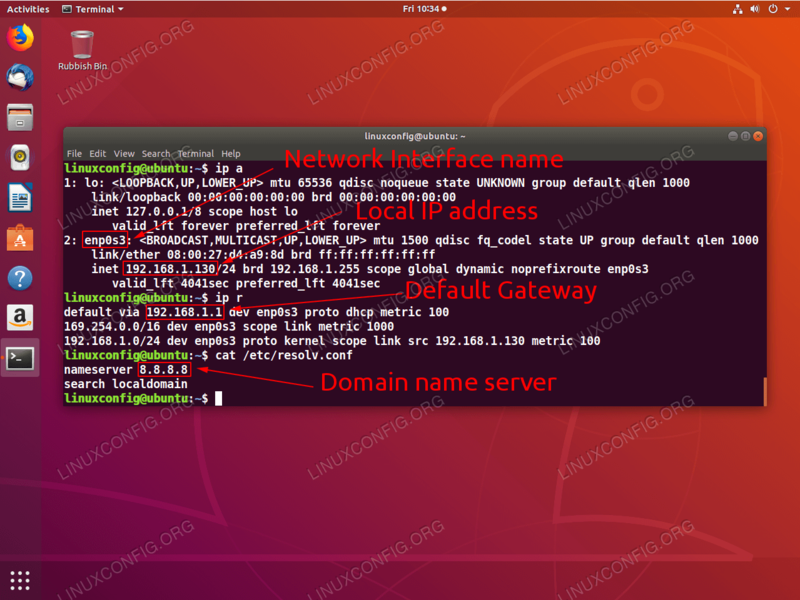 Linux commands to obtain the basic network configuration information. Now that once we obtain the most basic network configuration information we can use it to troubleshoot many kinds of network connectivity issues such as, for example, the Internet connection. The best tool for this task is the ping command. PING linuxconfig.org (104.24.11.18) 56(84) bytes of data. In case you are experiencing any Internet connectivity issues you can troubleshoot the network connections by pinging all above IP addresses either starting from your local IP address or any public host. Using this strategy will help you narrow down the possible issue causing your network connection problems as illustrated below. 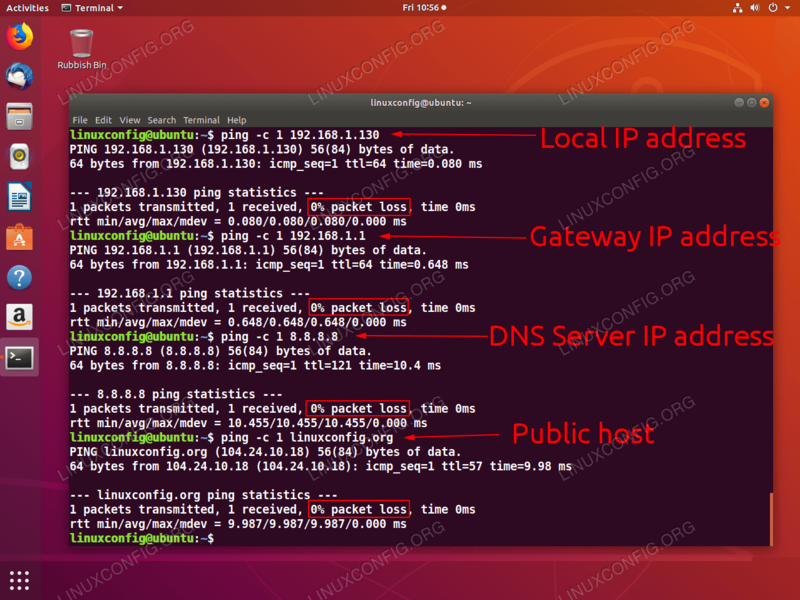 Troubleshooting the Internet connection using the ping Linux command. Every file or directory within the GNU/Linux filesystem can be owned by different users as well as various user groups. Furthermore, every file or directory can be set to conform to one or more permissions such as read, write and execute. The topic regarding file or directory permissions or ownership can cover a small book. Since we are interested in basics, here are some tips to get you started. Detailed file or directory information retrieved by the ls command and its -l long listing option. The tool to change file or directory permissions on the GNU/Linux file system is chmod. There are two ways on how to change file or directory permissions using the chmod command, namely, it is by octal or symbolic representation. From these two, the best approach is the one which you find easiest to remember and use. The last tool to be covered in this section is the chown command. The chown command allows the user to change a file or directory ownership. Each file or directory has two types of ownership. Namely, these are the user and group ownership. To change the ownership by using the chown command is a rather straightforward procedure. The generic rule of changing the file or directory ownership is to supply the chown command with two parameters. The first parameter supplied contains the username and the group name we wish this file or directory to be owned by separated by . and the second parameter representing the file or directory name in question. NOTE: To successfully change the file or directory ownership with the chown Linux command the following two rules apply. First, the user and group must exist and second, changing ownership from or to the root user or group requires administrative permissions. See the above sudo command explanation for more information. The chmod and chown Linux commands example usage. Experiment with the chmod Linux command's different permission variations. Can you explain how does applying the same set of permissions to a file or a directory differ? There are times when you need to troubleshoot your GNU/Linux box, hence you need to obtain information about your currently running kernel a.k.a the Linux. The Linux keyword actually refers just to the system's kernel, whereas the actual operating system's commands are based on the GNU free software binaries hence calling the entire operating system as GNU/Linux or Lignux is more appropriate and technically correct as oppose to referring to it simply as Linux. That is all folks! But, do not get the length of this article to fool you into thinking that there is nothing else to learn. On the contrary, this article barely scratches the surface, as the aim was to only introduce the reader to some basic GNU/Linux command line techniques. Please provide feedback below to help me improve this article. If you have any further question or need additional help, please visit the LinuxConfig forum. What should you learn next? Well, keep experimenting with the basics and try to add new Linux commands to your repertoire daily. Practice makes perfect! 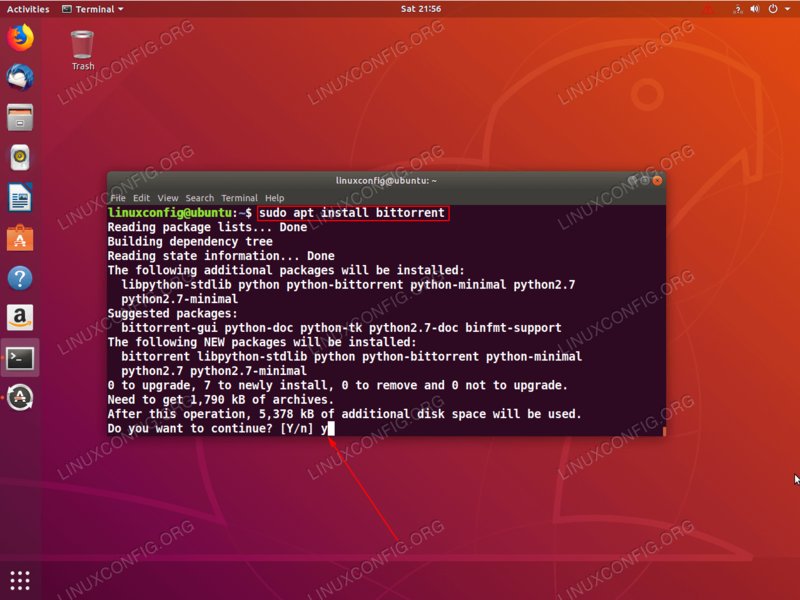 Once you are comfortable with basic Linux commands, consider my Bash Scripting Tutorial for beginners to discover how to automate tasks using Linux commands with the combination of shell scripting.